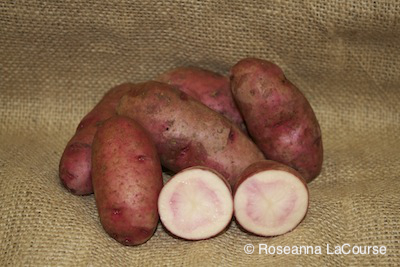 Our Products: Fingerling Potatoes > Red Thumb - Available! Dug as small "babies," these bright red-skinned thumbs of delicacy have beautiful dark pink flesh. Pleasing flavor and firm flesh is perfect for roasting with olive oil and rosemary, then caramelizing. Serve with your favorite steak and salad. An interesting fingerling for the specialty market. Very productive small- to medium-sized plant.